One of the fastest ways hospital space is used up is from the inefficient storage of unused or broken hospital beds, gurneys, and stretchers. They’re often stored haphazardly in hallways and corridors, causing fire hazards and making it difficult for staff to maneuver throughout the hospital, not to mention the potential risk of injury. 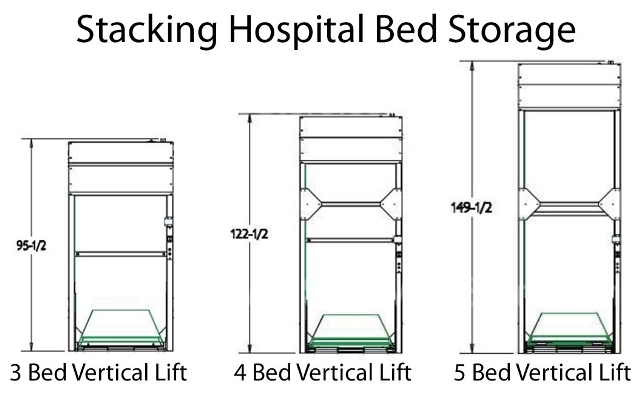 Automatic stacking bed lifts solve all of these problems by using vertical space to stack beds, allowing multiple beds to be stored in a single bed footprint. This makes the bed lifts an ideal solution for storing broken beds in need of repair, since they are stored out of the way but can still be accessed easily by staff. And by removing unused beds from hallways and corridors, you can more easily meet JCAHO standards for hospital bed storage. If your hospital is like many others, then your storage space is almost always at a premium. And with doctors, nurses, and healthcare staff busy saving lives, it’s not always easy or feasible to take the time to find better storage solutions. That’s why we’re here to help. The bed lifts are constructed with an innovative and durable design that is easy to use. The first bed to be stored is rolled onto the lift. The user then simply pushes a button and the bed is lifted, leaving open space underneath for the next bed to be loaded. The bed lifts are available in capacities of three, four, and five beds and have a weight capacity of 600 lbs. 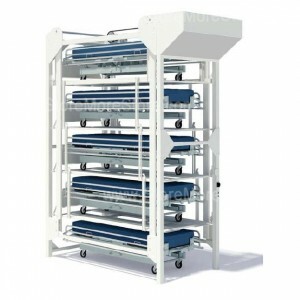 Automatic stacking bedlifts are available to buy online at StoreMoreStore. We would also be happy to assist you in deciding which bed lift configurations would work best for you. For additional assistance, call us at 1-855-786-7667.